The health promotion department of the Ghana Health Service has been elevated to the status of a division. The promotion of the department forms part of efforts aimed at improving health outcomes for all Ghanaians through improved health literacy. The new division has, therefore, been tasked with promoting early preventative strategies, healthy behaviours and well-being through the creation of environments, where individuals, families and communities are informed and empowered to live healthier, happier lives. The division intends to this do by increasing access to improved health services, managing prudently resources available for provision of health services, providing and prudently managing comprehensive and accessible quality health services with emphasis on primary healthcare in accordance with approved national policies. The Deputy Minister of Health, Tina Mensah, who officially launched the division, said ensuring health literacy is an effective health promotion approach that can accelerate action to improve health outcomes for those who have been least served. “As complex social and commercial environments are increasingly difficult for people to navigate and manage, it is important to make health promotion a priority,” she said. 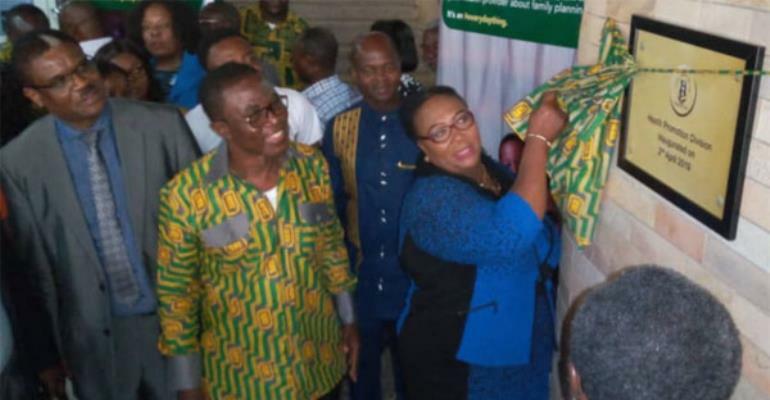 The minister, therefore, urged the division to develop health promotion programmes which will empower people and also strengthen individual and collective capacity to act for health and sustainable development. “Health promotion is not just the responsibility of the newly created division but a responsibility for all other divisions of GHS and agencies under Ministry of Health,” she added. Dr. Anthony Nsiah-Asare, Director General of the GHS, in his remarks, said the health service has often focused on curative and preventive healthcare to the detriment of other aspects of health like 'promotive' and rehabilitative healthcare. Dr. Nsiah-Asare indicated that the GHS, therefore, started the process by upgrading the health promotion department to be able to do more work on educating the public on health. Development partners like the USAID, WHO, UNICEF and JICA congratulated the service for seeing the need for health promotion as a critical aspect of healthcare provision in the country. There were of the hope that the division would provide the needed leadership to promote health education in the country and hoped that the service would provide the division with the needed resources to execute its tasks.